Monday - Thursday from 9:00 AM - 3:00 PM and by appointment only. To make an appointment, call (916) 625-5431. Please leave a message with your name, case number and phone number if you are unable to reach the Evidence Technician in person. You will receive a call back as soon as someone is available. Please bring a photo I.D. to your appointment. Monday – Thursday from 9:00 AM – 3:00 PM and by appointment only. For each handgun, you must provide the descriptive information requested. Most of this information can be found on the “Property Record/Receipt” you received from the law enforcement agency or court. 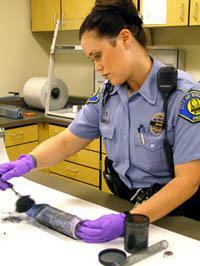 You may also obtain this information by calling our Evidence Technician during business hours at (916) 625-5431. Once you receive a clearance from DOJ, make an appointment with the Evidence Technician to pick up your firearm.Bring your clearance letter to your appointment along with a photo I.D. Weapons and illegal contraband are destroyed.